November was a very busy month for us, so we’d like to apologise for the lateness of this month’s development roundup. We’ve been working hard on putting your feedback from the first iteration of the Fleet Combat and Planetary Colonisation betas into the game, and now have most of the suggestions implemented. The combat and planet betas have now been successfully merged together into a combined client that will become the first iteration of the galaxy beta. Work has now begun on the Galaxy screen and main UI menus, and we’re working hard on getting that ready to show to all beta backers as soon as possible. We’ve just launched the second round of the Predestination beta, introducing the planetary exploration and colonisation gameplay. If you’re one of our beta backers or are otherwise signed up to test the game, check your Kickstarter mail or email for a message from us with a download link. If you were supposed to be in the beta but didn’t get an email, please send us an email to planetbeta@brainandnerd.com and we’ll sort it out for you. The Predestination Combat Beta is now live! The first Predestination beta stage is on its way! Stage 4: Final beta with all three combined. This will then undergo regular gameplay iteration and feedback cycles until it’s release quality. Hello everyone! It’s certainly been a productive month here at Brain and Nerd, not to mention a very, very busy one! Between Game Development, two more Work Experience students, preparation for ‘Q-CON’ and preparing to launch our Steam Greenlight page we’ve certainly not been short of things to do this month! April is over and development on Predestination is going well. This month we completed the internal workings for the ship design and weapon technology systems, finished hooking the tactical combat system into the main game and tidied that system up. We implemented tons of your ideas into the ship combat system, like smart-missiles that deploy mines around the target, weapons that fire clouds of charged plasma, and deployable minefields for planet defense. Thanks so much for all of your great ideas and feedback! Character artist Connor Murphy has finished our final core race (the yet-to-be-named Aquatic race) and completed a fantastic visual reboot of our first robotic race, The Starforged. You can see the new artwork for both races below! We’ve also been working with Connor on figuring out the best way to approach the backer-sponsored race artwork. The past month has been jam-packed for the Predestination crew. We made a lot of progress with the fleet combat part of the game, designed our first reptilian race (The Sauros), and hosted work experience weeks for two students aiming for careers in the games industry. We also moved to a new house with more office space to work in and applied for some government funding to help your pledges stretch further. Added projectile weapons such as mass drivers, with their own graphical effects. Added dumb missiles that travel to the target hex and explode, or explode early if they enter a hex with another ship or object in it. Implemented smart missile AI that locks onto a ship and follows it, avoiding obstacles. Added interceptors. They use the smart missile AI and attack the target ship every turn until destroyed. Implemented area-effect weapons (smartbombs, area missiles). Implemented proximity mines and cloaked proximity mines. Created some basic explosion effects with screen shake, and a timing system to synch explosion graphics and screen shake with sound effect volume. Implemented a module system that lets us create interesting non-weapon ship technologies. Modules added so far include: Holographic Projector Matrix (creates decoy holographic ships), Afterburner (double movement for one round, then takes a round to recharge), Shield booster (consumes movement points to boost shield hitpoints), Cloaking device (ship is invisible until its next turn, but then takes a round to recharge). Fleets can now engage each other in the galaxy view, which switches to the fleet battle screen. Ships can now retreat from combat. They will wait for one full round without moving or attacking and then warp out. Combat now detects the winner when one side’s ships are all destroyed or warp out. Ships destroyed in combat are now removed from the galaxy view. 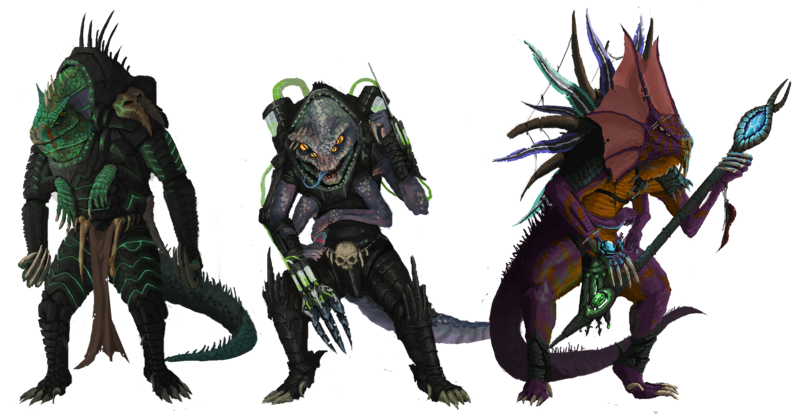 The purple Monitor Sauros: The shamanistic ruling caste and diplomatic contacts for the empire. They are native to the desert regions of their home world and are worshiped as if they were gods. The white Albino Sauros: A rare breed possessing an immense intellect. They are native to desert regions and are responsible for all scientific discovery in the empire. The green Jungle Sauros: Have been selectively bred to be the perfect labourers and ground combatants. They are native to the jungles of their home world and make up the majority of the Saurosian population.